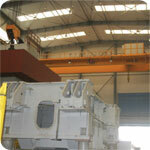 Automotive Industry | GH crane and hoist manufacturer. 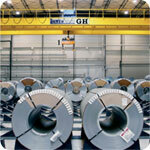 Wide range of cranes used for press parts manufacturing and assembly. We understand that specific processes are needed and tailor made solutions are offered to cover all of them. 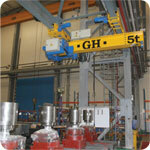 Standard hoist mounted cranes equipped with the needed options such as semiautomatic/automatic operation. Suitable tools for coils handling and cycle assurance are always advised while we can adapt to any tool chosen by our clients. 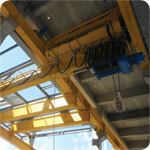 Double hook hoist standard cranes are most widely used. The efficiency in the process is essential and our big range of speeds delivers satisfying solutions for our clients. Specific processes require specific standard and special solutions. Transfer cranes equipped with micro-speed function or under slung cranes are examples of how we understand your needs. 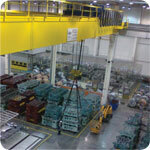 In specific sections of some OEMs factories, Standard wire rope hoist mounted cranes up to 16-20 ton are needed. Chain hoists mounted cranes are also part of our offer.